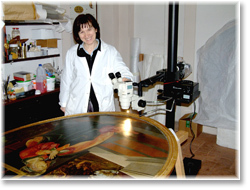 HOME > scientific diagnostic for art restoration . . . The Studio’s scientific diagnostic methods make use of the most advanced technologies, such as new applications of thermographic investigations supplemented by radiographic analyses (see our scientific research published in OPD Restauro, 18, 2006). 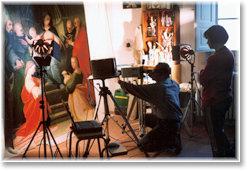 Other techniques include: IR, UV, chemical and stereomicroscopic analyses. Vertical stereomicroscope with fibre optic illumination.